This is a card I have made with my daughter for her friends birthday. 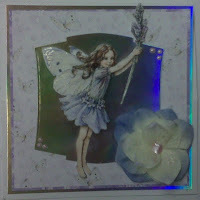 I have used a fairy off the Crafter's Companion Flower Fairies CD. It is an easel card but as we were having problems photoing the card you can only see the outside.